As the show progressed, the women wore the traditional pageant garb ... swimwear to evening gowns and did an incredible job of maintaining their poise (considering the youngest among them was 17 years old). I don't think I could tie my shoes at that age ... at least not without help. My favorite segment was the talent portion. Miss Nebraska played a version of Chopsticks on Steroids, Miss Oklahoma (my personal favorite) did a ballet toe-thing and Miss Arkansas came out on stage with two dummies with microphones. I started to moan ... so did the people around me. Was this a bad Ed Sullivan Show routine? Ventriloquist? You've got to be kidding. Then she started singing ... and the dummies sang ... and they yodeled ... and we all went wild. It was superb! Miss Arkansas was a huge hit. She came in first runner up (a nice way to say second place) ... Miss Nebraska took home the crown ... the first and only 17 year old to win. "And the 53rd Runner Up is ..."
Of course there were losers that night. Most of them seemed to hang out in the Bellagio lobby at 3 in the morning looking not-so-lovely in their black short dresses, spiked heels, runny makeup with drool sitting on their chins (that is drool right?). Wait a minute ... those are NOT contestants after all. And that is NOT drool. And those girls are much younger than 17. 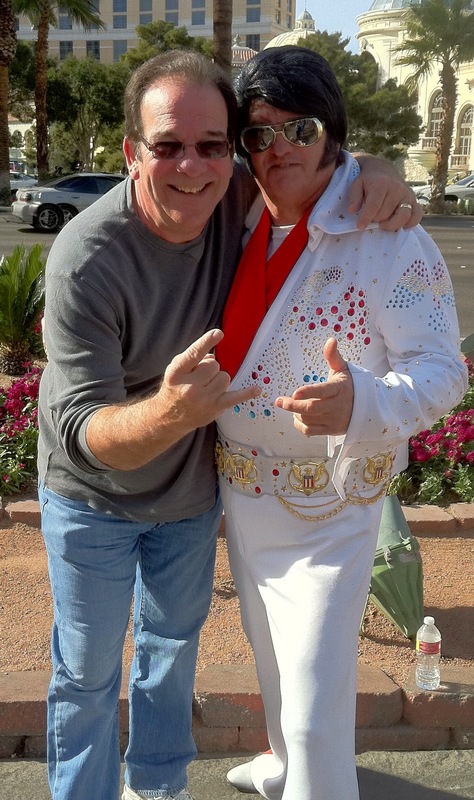 I met so many famous people outside on the strip. Elvis stopped to take a picture with me (and only charged me $5). I guess ever since he died and the economy tanked ... the price of stardom has declined. He looked pretty healthy in this picture. Funny ... I walked a little further and saw him again. 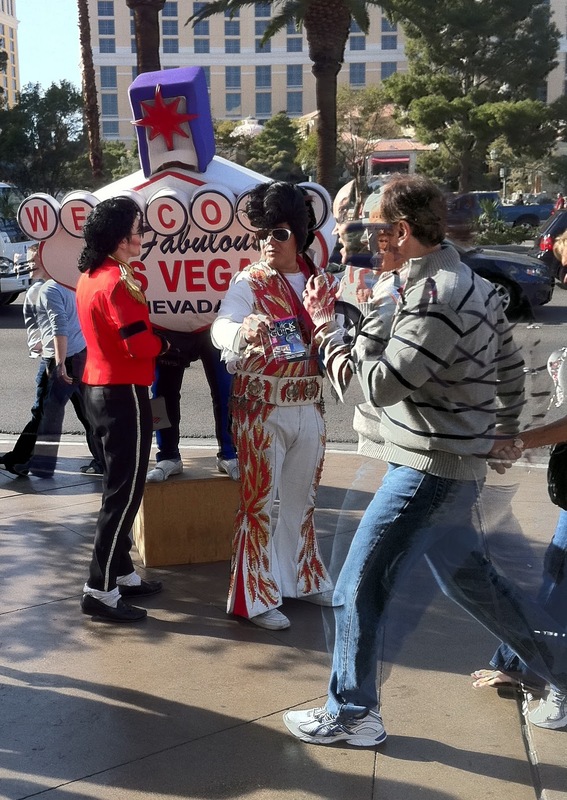 This time he was with Michael Jackson and a Vegas sign man. Two dead guys and something that was never alive at all. "Yeah .... that's right ... the buffet, see?" This is one of my favorite characters ever. I actually thought I heard my dad behind me ... just a touch more Jersey ... talking about the only topic old guys really care about ... FOOD. "(Talking on a cell phone ... LOUDLY) So we get to this place Nero's ... Hello? ... Nero's ... like the king ... yeah ... N E R O ... and you don't get nothin' ... that's right ... Hello? Huh? ... nothin' I said ... a lousy piece of steak and nothin' else for $58 ... 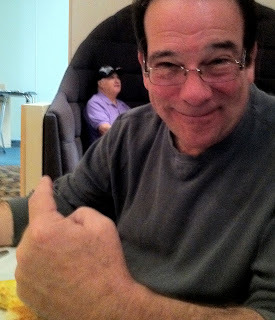 I had mushrooms too ... but I had to pay for that separate ... 'sposed to be the best place in Vegas ... I'll never eat there again ... nothin' ... what a lousy place ... Hello? ... What? ... Today? ... I'm at the buffet ... yeah ... the buffet ... I had an omelette with peppers ... to make it spicier, you know? ... yeah ... oranges ... pineapples ... bananas ... Hello? ... Huh? ... "
"Let's get our nails done ... what do you think? How much can you gamble?" Debbie and I had some real bonding time. When you're done shopping and just can't gamble another minute (do normal people really feel that way?) ... then according to Debbie it's time for a boy/girl manicure. That's really all I can say about that. "Man ... is HE big." My favorite line of the trip. Just then, a young guy in a business suit turned around and answered ... "That's what SHE said."